This little rock squirrel has a cuter, comfier house than most of the kitties and doggies I know! It kind of reminds me of one of the houses from The Smurfs -- remember them? It's the smurfiest! 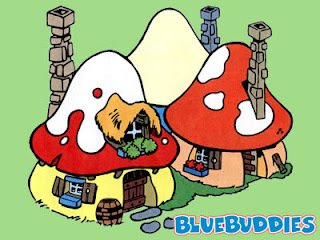 Here's a Smurf house for comparison... It does look like it, right? I've got to know where to get a house like that!